Rev. Bob Breihan, Methodist minister and longtime social activist, on Rag Radio, November 29, 2013. Photo by Roger Baker / The Rag Blog. Our November guests were a Methodist minister and longtime social activist, a noted citizens' advocate, two staffers from the original Rag, the author of a book about the 'movement that started the civil rights movement,' and an acclaimed singer-songwriter. 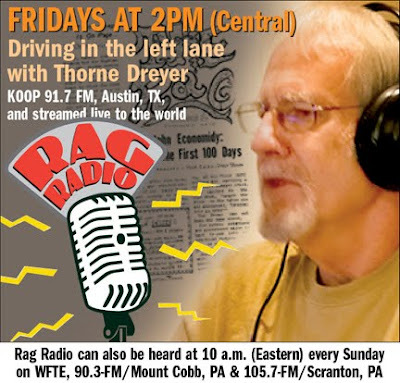 Thorne Dreyer's guests on Rag Radio in November 2013 included Methodist minister and longtime social activist, Rev. Bob Briehan; citizens' activist and author Sam Daley Harris; progressive Maryland legislator Doyle Neiman with poet-activist Mariann G. Wizard, both staffers of the original Rag in the '60s; Susan D. Carle, author of a groundbreaking study of nineteenth century social and legal activism; and noted Austin-based singer-songwriter Slaid Cleaves. Rag Radio is a weekly syndicated radio program produced and hosted by long-time alternative journalist Dreyer and recorded at the studios of KOOP 91.7-FM, a cooperatively-run all-volunteer community radio station in Austin, Texas. Rev. Bob Breihan, a United Methodist minister, was state director of the Texas Methodist Student Movement in the 1950s and directed the Methodist Student Center at the University of Texas at Austin from 1960 to 1980. In 1986 he founded the New Life Institute, a non-profit training organization that provides emotional and spiritual counseling to those in need, regardless of ability to pay. Rev. Breihan is now retired and living in Austin. Bob Breihan was an active participant in the civil rights and desegregation movement in Austin from the early 1950s, and was a vocal opponent of the Vietnam War. The Methodist Student Center under his tenure was a haven for student radicals and other wayward souls. It was home to the Ichthus Coffee House, where Pete Seeger and Janis Joplin performed, and to Sattva, Austin’s pioneering vegetarian restaurant and commune. Rev. Breihan assisted the Vets for Peace and counseled conscientious objectors during the Vietnam War and, later, young women seeking abortions. Activist and citizens' advocate Sam Daley-Harris, a former music teacher and classical percussionist, "has helped thousands of ordinary citizens transform from hopeless bystanders to powerful advocates." He is the author of Reclaiming our Democracy: Healing the Break Between People and Government, which recently was published in its updated 20th anniversary edition. In 1980, Sam Daley-Harris founded RESULTS, a grassroots lobbying group that, according to The New York Times, "has had major success building support in Congress for initiatives aimed at basic needs for the poor." In 1995 Daley-Harris and Nobel Peace Prize Laureate Muhammed Yanus founded the Microcredit Summit Campaign that provided microloans to more than 100 million of the world's poorest families. He also mentored the founder of Citizens Climate Lobby prior to its launch in 2007, and in 2012 started the Center for Citizen Empowerment and Transformation, a group that works with the leadership of organizations to empower their members and train them to work for social causes like "ending poverty, cleaning up the environment, building local economies, and bringing peace to the world." From left, Rag Radio's Tracey Schulz, guest Mariann Wizard, host Thorne Dreyer, and guest Doyle Niemann, at the studios of Austin's KOOP-FM, November 15, 2013. Photo by Alan Pogue / The Rag Blog. Doyle Niemann is now a progressive leader in the Maryland House of Delegates, and Mariann Garner-Wizard is an Austin-based poet and social activist. Niemann and Wizard (then Mariann Vizard) both worked with The Rag, Austin’s now legendary underground newspaper, published from 1966-1977. Doyle Niemann was an anti-war activist at the University of Nebraska and the University of Texas where he worked with the Young Democrats and the Students for a Democratic Society (SDS). He later was on the staff of underground newspapers Space City! in Houston and The Great Speckled Bird in Atlanta, and was founding managing editor of the national progressive newspaper, In These Times. In 2002 Niemann was first elected to the Maryland House of Delegates where he is a legislative leader on environmental and housing issues. Mariann Wizard has been a progressive activist since the ‘60s and an advocate for drug law reform. She is a widely-published poet, a professional science writer specializing in natural health therapies, and a regular contributor to The Rag Blog. Her recent books include Did You Hear Me the First Time? and End Games, a book of poetry and drawings, and Hempseed Food: The REAL Secret Ingredient for Health & Happiness. Carle is a professor at American University Washington College of Law where she teaches legal ethics, anti-discrimination law, labor and employment law, and torts. She writes primarily about the history of social change lawyering, legal ethics, and the history and sociology of U.S. lawyers. Carle has been a community organizer, a civil rights lawyer, and a union-side labor lawyer. She graduated from Yale Law School in 1988 and received the 2001 American Association of Law Schools Best Junior Scholar Award and the 2006 Jean and Edgar Kahn National equal Justice Library Award for her writing on the early history of the NAACP. Go to our earlier post about the show at The Rag Blog -- for information and photos from our interview with Slaid Cleave, who joined us in interview and lively performance. Rag Radio is hosted and produced by Rag Blog editor Thorne Dreyer, a pioneer of the Sixties underground press movement. Dreyer was a founding editor of the original Rag, published in Austin from 1966-1977. Tracey Schulz is the show's engineer and co-producer. 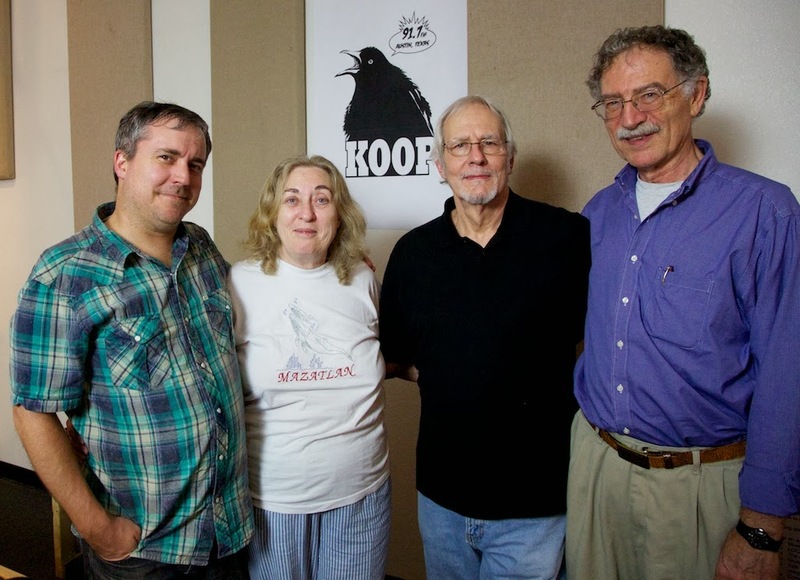 Rag Radio has aired since September 2009 on KOOP 91.7-FM, an all-volunteer cooperatively-run community radio station in Austin, Texas. Rag Radio is broadcast live every Friday from 2-3 p.m. (CST) on KOOP and is rebroadcast on Sundays at 10 a.m. (EST) on WFTE, 90.3-FM in Mt. Cobb, PA, and 105.7-FM in Scranton, PA. Rag Radio is also aired on KPFT-HD3 90.1 -- Pacifica radio in Houston -- on Wednesdays at 1 p.m. (CST). THIS FRIDAY, December 20, 2013: Historian, author, and publisher of nonfiction comics, Paul Buhle, editor of Radical Jesus: A Graphic History of Faith. Paul Krassner : Is There a Doctor in the House?